It’s 1861 in Missouri, a border state in which slavery is legal. The new Governor, Claiborne F. Jackson, is pro-Southern and wants to take his State out of the Union and into the Confederacy. Meanwhile, Frank Blair is just as determined to do whatever it takes to keep Missouri in the Union. Early in 1861, Blair obtains an ally in his cause when Captain Nathaniel Lyon is reassigned to provide security to the St. Louis Arsenal in St. Louis. Both sides scheme to get control of the arsenal and its valuable store of armaments. The competition for the arsenal escalates into armed conflict when a large force of Federal Volunteers under Lyon’s command surrounds and captures an encampment of Missouri State Militia at Camp Jackson in St. Louis. The escalation continues when Brigadier General Lyon moves against the State capital and sends Governor Jackson into exile. Missourians march against Missourians in the Battle of Boonville, then the Battle of Carthage before ending with the Southern victory at the Battle of Wilson’s Creek. 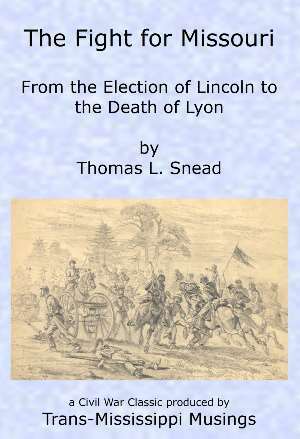 Thomas L. Snead was in a unique position to provide an eyewitness account of the events taking place in 1861, the year in which the American Civil War came to the State of Missouri. In 1860, Snead wrote about politics for the Evening Bulletin, a St. Louis newspaper. Shortly after Claiborne Fox Jackson was inaugurated as Governor of the State of Missouri, Snead left the Bulletin and became a full-time aide to the new Governor. As a result, Thomas Snead was present at all of the key events which took place in Missouri in at the start of the American Civil War.